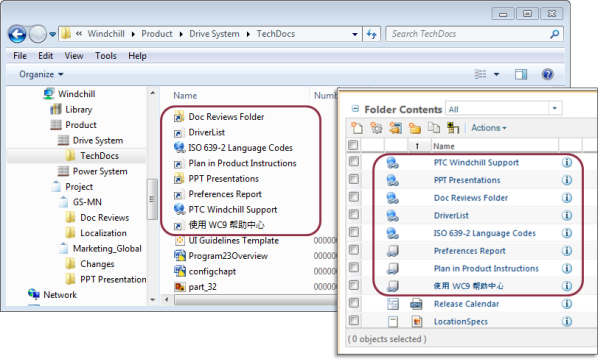 In PTC Windchill 10.2 M010, additional right-click menu options, drag-and-drop actions, and object types have been added to Windows Explorer when using the Windchill Desktop Integration plugin. Windchill links: When enabled, Windchill link objects appear in Windows Explorer. Depending on the link type, these links can provide shortcuts to other documents or folders, directly open a Windchill document, or open a URL in a web browser. Folder actions: New Folder, Manage Security, and Edit. Download Primary File: Download content from the Windchill server, regardless of whether a version already exists in your local cache. Upload content with edit: When performing an Edit action on a document, updated content is uploaded from your local cache. Drag-and-drop Outlook attachments: You can now create a new Windchill document when you drag-and-drop an attachment from a Microsoft Outlook message to a Windchill folder. Drag-and-drop between folders: Additional drag-and-drop abilities allow users to copy and move documents between folders within Windchill. For more information, see the "Windchill Desktop Integration" topic in the PTC Windchill Help Center. Tip: Enter the topic name in the PTC Windchill Help Center search field to easily navigate to the topic.